Since 1958, WRL has awarded almost annually its War Resisters League Peace Award to a person or organization whose work represents the League's radical nonviolent program of Gandhian action. In 2013, in honor of the beloved Ralph DiGia, WRL began to award the Ralph DiGia Award almost annually. Speakers: Murray Kempton, Bayard Rustin on India. Awardees were among the founders of WRL. They were active in the women's suffrage movement early in the century, and were committed peace activists beginning with their opposition to World War I. Between the two World Wars, both worked with the Women's Peace Union. They each also wrote extensively, including books, plays and articles, frequently on anti-war themes. Speakers: Douglas Campbell, Rustin on Tanganyika. A pacifist, anti-racist activist, and radical journalist, Jim was a member of the Fellowship of Reconciliation and the Congress on Racial Equality. In 1947, Peck participated in the Journey of Reconciliation, an early attempt to test segregation laws in the south. He later helped organize and participated in the Freedom Rides of 1961. Speakers: Evan Thomas, AJ Muste. 1986 Peace Award: Plowshares Disarmament Community . 1987 Peace Award: : Dorie Bunting. Dorie has been a lifelong activist in the Peace and Justice movement. Following World War II, she went to Europe with the American Friends Service Committee to assist with relief and reconstruction efforts. In the 1960s, she became active against nuclear testing in her home state of New Mexico, and later became involved in the movement against the Vietnam War. In 1983, Dorie and others founded the Albuquerque Center for Peace and Justice, and throughout the 1980s. Dorie has also worked with the Inter-hemispheric Resource Center to promote progressive foreign policy alternatives. 1988 Peace Award: : Those who have continued to focus peace work on Vietnam post-war: Don Luce, Vietnam Veterans Against the War, John McAuliff, David Truong, Bob Eaton and Lady Borton. Pivotal Civil Rights Movement organizer and math educator Bob Moses founded The Algebra Project in the 1980s, bringing crucial math skills to poor communities to help kids get a shot at workforce equality for the 21st century. During the 1960s he was an integral participant in the civil rights movement, organizing voter registration drives, sit-ins and Freedom Schools for the Student Nonviolent Coordinating Committee. The Algebra Project is a national mathematics literacy effort aimed at helping low income students and students of color - particularly African American and Latino/a students - successfully achieve mathematical skills that are a prerequisite for a college preparatory mathematics sequence in high school and full citizenship in today's technological society. Author of The Algebra Project's Transition Curriculum-Book I, Robert continues to develop curriculum. Committee for the Rescue and Development of Vieques. Committee for the Rescue and Development of Vieques is a non-governmental organization in Vieques working diligently to stop the bombing of their populated island. Until recently, the US Navy owned over two-thirds of Vieques. When the US bought this land in the 1940s, many families and farmers were forced out of their homes and off their lands to make way for military exercises, which began in 1947. Puerto Ricans of Vieques objected to the US Navy's presence across many other ideologically divisive issues regarding the US. Bush announced that the Navy would leave Vieques in June 2001, and it is widely accepted that it was the success of the protest movement that led to this decision and to the US Navy's withdrawal. On May 1, the citizens of Vieques celebrated the first day in over 60 years without a US Navy bombing run. For more information on the Committee for the Rescue and Development of Vieques, you can visit their website directly at www.viequeslibre.org. 2001 Peace Award: Kate Donnelly and Clay Colt. Clay Colt and Kate Donnelly of Progressive Resources, one of the oldest suppliers of peace paraphernalia in the country, began channeling their social activism into bumper stickers and buttons 27 years ago. They began by printing bumper stickers on a proof press in their basement in New Jersey in 1975. Kate and Clay are active in the Northeast Coalition for Peace and Justice, which holds peace vigils every week in Willimantic. Donnelly/Colt has chugged along for years on products promoting social justice, diversity and human rights. 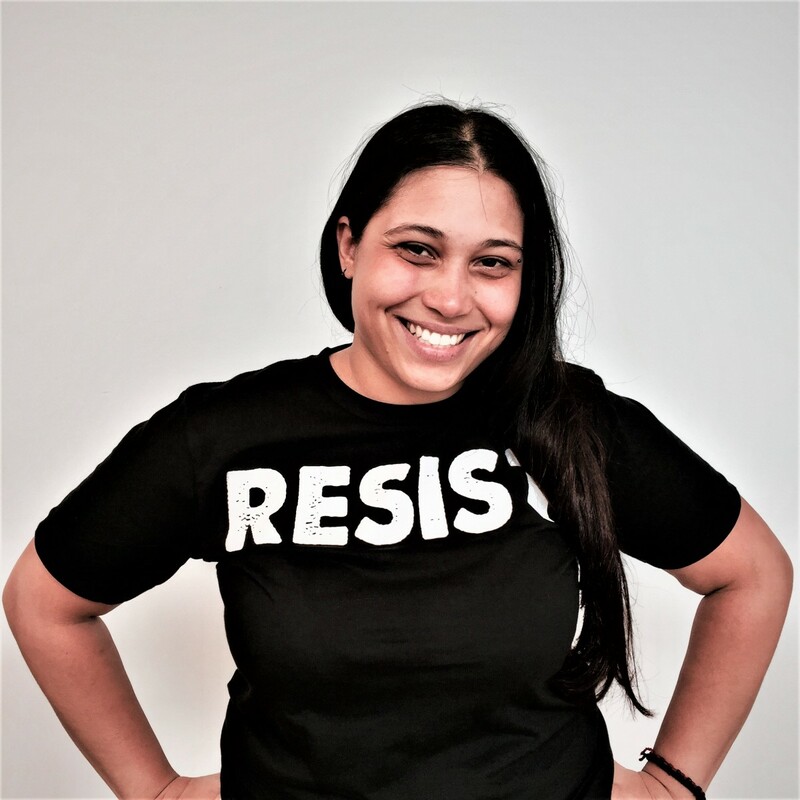 Kate's social change work has evolved from organizing protests and preparing people to participate in nonviolent civil disobedience actions, to doing conflict resolution and diversity work in schools. Clay goes to various events and conferences, to bring their resources to more activists, early childhood educators, social studies teachers, gay and lesbian activists, college events, music festivals and so on. He also spends a lot of time in schools, training kids to become peer mediators, talking about diversity and anti-bias, teaching conflict resolution skills and talking about being an activist. To read more about Clay Colt and Kate Donnelly, visit their website at www.donnellycolt.com. 2002 Peace Award: Christian Peacemaker Teams. Christian Peacemaker Teams (CPT) was conceived in the mid 1980s when peace church people were seeking new ways to express their faith. It offers an organized, nonviolent alternative to war and other forms of lethal inter-group conflict. CPT provides organizational support to persons committed to faith-based nonviolent alternatives in situations where lethal conflict is an immediate reality or is supported by public policy. The vision is to enlist the response of the whole church in conscientious objection to war, and the development of nonviolent institutions, skills and training for intervention in conflict situations. To read more about CPT, visit their website at http://www.cpt.org. 2003 Peace Award: September 11 Families for Peaceful Tomorrows. Peaceful Tomorrows is an advocacy organization founded by family members of September 11th victims who have united to turn their grief into action for peace. Their mission is to seek effective, nonviolent solutions to terrorism, and to acknowledge the common experience that they have with all people similarly affected by violence throughout the world. To read more about Peaceful Tomorrows, visit their website at http://www.peacefultomorrows.org. 2004 Fernando Suarez del Solar of Military Families Speak Out. Founder of Proyecto Guerrero Azteca (guerreroazteca.org) in memory of his son, Jesus Suarez del Solar, who was killed in Iraq on March 27, 2003. 2006 Peace Award: Women Resisting War from within the Military. The awards were presented to Diedra Cobb, Anita Cole, Kelly Dougherty and Katherine Jashinski by Lt. Col. Ann Wright (ret.) who resigned her command in protest of the Bush war-making. 2007 Peace Award: Taking on the Torturers. The awards were presented to the Center for Constitutional Rights (CCR) and The Torture Abolition and Survivors Support Coalition International (TASSC) for their leading roles in defense of human rights. Initiated the Grace Paley Lifetime Achievement Award, giving it to Grace Paley posthumously. Erika Weihs got special recognition for the many years she did calligraphy for the Peace Award. 2008 Peace Award: Make Levees Not War: Shana Griffin and Kali Akuno representing grassroots groups working to rebuild New Orleans. A concert with Steve Earle, Allison Moorer, Stephanie McKay, Red Baraat Festival, and Jan Bell and the Cheap Dates. 2010 Peace Award: Kathy Kelly, Founder of Voices for Creative Nonviolence. She was given the award at a small event in NYC during the weekend of May 2, 2010, when many people came to protest and have an alternative conference to the Review Conference of the Non-Proliferation Treaty happening at the UN. WRL had a large action and civil disobedience at Grand Central Station. 2011 Peace Award: WRL decided to give the 2011 Peace Award to Afghan Youth Peace Volunteers, an Afghan grassroots peace group.The award was declined and they sent us a moving letter explaining that they didn’t want to be exceptionalized by an award, as awards can distract from the masses of people in Afghanistan needing support and a voice. 2012 Peace Award: Suez Port Worker and Labor Leader Asma Mohammed: U.S.-made tear gas has continued to rain down on protesters in Egypt calling for Morsi to reverse his decision as well as on those who filled Mohamed Mahmoud Street to call for justice and accountability for those who were gassed, beaten and murdered there exactly one year ago. Much of the tear gas --- then and now --- was made in Jamestown, Pa., by Combined Systems Incorporated, the same manufacturer whose seven-ton shipment, approved by U.S. government, was refused on November 27, 2011 by Asma Mohammed and her fellow customs workers at the Port of Adabiya in Suez. 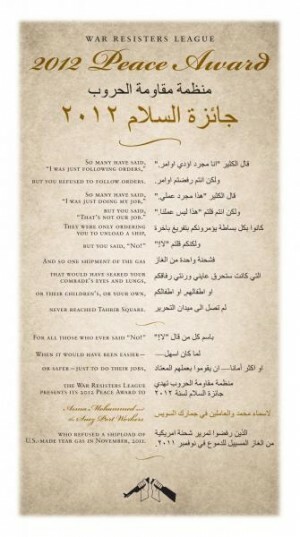 More on Asma's award here. 2014 No Peace Award was given this year, but we did give the 2014 Ralph DiGia Award to Ruth Benn. 2015 Peace Award: Mumia Abu Jamal - WRL honors Mumia Abu Jamal's enduring bravery of thought, commitment to racial justice, and continued fight for liberation from tyranny. Internationally celebrated black writer and radio journalist, author of eight books and hundreds of columns and articles - including those published in WRL's own WIN Magazine, organizer and inspiration for the prison lawyers movement, former member of the Black Panther Party and supporter of Philadelphia's radical MOVE organization, Mumia Abu Jamal has spent the last 30 years in prison - almost all of it in solitary confinement on Pennsylvania's Death Row. Known worldwide as a political prisoner, Mumia Abu Jamal's reporting on police brutality and racism exposes the brutal oppression of national and international revolutionary movements. Since federal courts ruled unconstitutional Mumia's death sentence for the shooting of Philadelphia police officer, Daniel Faulkner, Mumia Abu Jamal is serving a Life Without Parole sentence in Pennsylvaniaís general prison population. Systematically denied due process involving prosecutors' withholding evidence, racial bias in juror selection, and a judge's rampant bias, Mumia Abu Jamal's struggle for freedom not only signifies the loss we incur in the face of racist, corrupt, and abusive systems, but reminds us of our collective power to hope, to struggle, and to envision better. 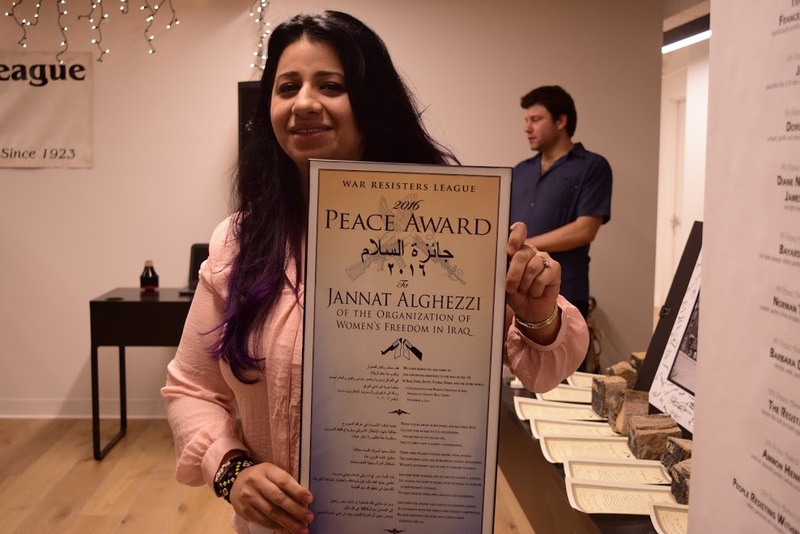 2016 Peace Award: Jannat Al Ghezzi - WRL honors Baghdad-based Jannat Al Ghezzi of the Organization of Women's Freedom in Iraq. Award text reads: "We stand behind you and carry on our resistance to the rule of the 1% In Iraq, Syria, Egypt, Tunisia, Yemen, and the entire world." [—Organization for Women's Freedom in Iraq Message to Occupy Wall Street November 3, 2011]. When voices arose in wounded and battered Iraq; Calling for an end to U.S. occupation, the return of its stolen oil; And its own—not a puppet—government; There were women's voices among them, joining the centuries-long and worldwide chorus demanding Women's autonomy and an end to gender violence. Shelters were formed, and in one you found a school, You found out how to share your courage, to nurture other women’s courage, To lead them in their own capacity for leadership. And then you helped that group go further, deeper, To solidarity with the ninety-nine percent everywhere, Because freedom for some must always mean freedom for all." More on the 2016 award here. 2017 Peace Award: Mariame Kaba. Mariame Kaba is a Black feminist, abolitionist and freedom dreamer. This year, we honor Mariame for her 20 years organizing in Chicago, striving to dismantle the prison industrial complex and dreaming of a world where Black women and girls can be free. In 2017 WRL also gave the Grace Paley Lifetime Achievement Award to Rasmea Odeh. Rasmea Odeh is a Palestinian activist, organizer and force of nature. This year, we honor Rasmea for embodying “Resistance Lives Forever,” for five decades of resisting Israeli occuplation despite imprisonment, torture, and solitary confinement.